Emergency teams rest outside of structural damage caused by heavy rains, July 9, 2018, in Hiroshima, Japan. Japanese rescuers are searching for dozens still missing after severe flooding destroyed homes and left more than 100 people dead. Counting casualties has been difficult because of the wide area affected by the rainfall, flooding and landslides since late last week. At least 80 people were still unaccounted for, many in the hardest-hit Hiroshima area, where 1000s of homes now lack power and clean water. 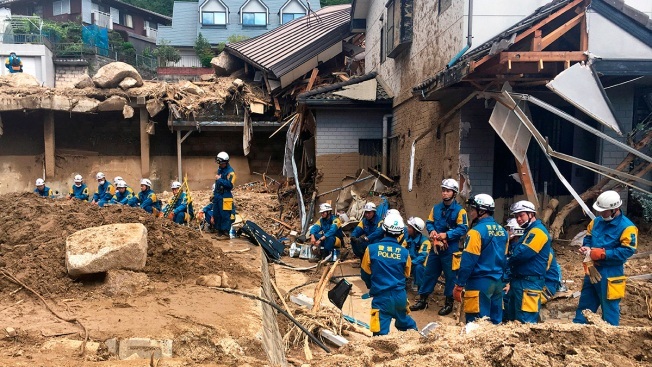 Rescuers in southwestern Japan dug up more bodies Monday as they searched for dozens still missing after heavy rains caused severe flooding and left residents to return to their homes unsure where to start the cleanup. More than 100 people were confirmed dead in the disaster. Minoru Katayama, 86, rushed back to his home in Mabi city, in Okayama prefecture, and found his 88-year-old wife, Chiyoko, collapsed on the first floor. Floodwaters had started rising so fast that the elderly couple was caught by surprise. "My wife could not climb up the stairs, and nobody else was around to help us out," Katayama told national broadcaster NHK. 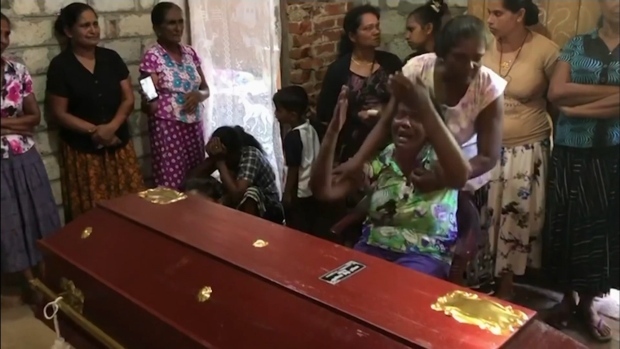 His wife, who stayed behind and let her husband flee, was among more than 20 people who were found dead in the city, where a river dike collapsed. At a hospital in Mabi town, about 300 patients were temporarily trapped inside, but all had been safely airlifted by emergency rescue workers by early Monday. The Fire and Disaster Management Agency said 108 people were confirmed dead as of Monday night. Officials and media reports said at least 80 people were still unaccounted for, many of them in the hardest-hit Hiroshima area. The Japan Meteorological Agency said as much as 10 centimeters (3 inches) of rain per hour fell on large parts of southwestern Japan. All rain warnings have been lifted. A Hiroshima resident, Seiji Toda, took precautions because of his memories of flooding four years ago that killed more than 70 people in Hiroshima. But he was shocked and helpless when he saw his restaurant, which he opened nearly 40 years ago, filled with mud heaped about 1 meter (yards) above the floor and windows smashed. Tables, covered with clean white tablecloths before he left, were all mud-covered, chairs thrown to the floor. "I had never seen anything like this," he said on TBS television, standing outside his restaurant in Hiroshima city while wearing a helmet. Next to his restaurant were heaps of broken trees and other debris. Several cars were still half buried in the mud. The assessment of casualties has been difficult because of the widespread area affected by the rainfall, flooding and landslides since late last week. Authorities warned that landslides could strike even after the rain subsides. Officials in Ehime prefecture asked the central government to review a weather warning system, noting that rain warnings were issued after damage and casualties were already reported, a possible cause of the region's extensive damage. Some homes were smashed, while others were tilting precariously. Rivers overflowed, turning towns into lakes and leaving dozens of people stranded on rooftops. Military paddle boats and helicopters brought people to the ground. In large parts of Hiroshima, water streamed through a residential area, strewn with fallen telephone poles, uprooted trees and mud. Thousands of homes were without clean water and electricity in Hiroshima and other hard-hit areas, where many people lined up for water tanks under the scorching sun, with temperature rising as high as 34 Celsius (93 Fahrenheit). At a local elementary school in Hiroshima's Yano district, dozens of residents took shelter and some shared their stories of narrow escape from the landslides and floods. Supplies such as water, blankets and cellphone chargers were provided. Ryutaro Hirakawa, 18, said he fled his house after smelling a strange odor coming from the ground, a sign of a landslide. "The smell of soil and grass was so strong when I opened the window," he said. "There were landslides." Another resident, 82-year-old Saburo Yokoyama, said he was horrified when he saw floodwater flowing just outside his house. "It was scary, just scary. In front of our house had become a river, and was making a huge noise," he said. Prime Minister Shinzo Abe canceled his planned July 11-18 trip to Europe and the Middle East to oversee the emergency response. Abe said earlier Monday that the government had dispatched 73,000 troops and emergency workers for the search and rescue effort. "The rescue teams are doing their utmost," he said. In Uwajima town in Ehime prefecture, an overflowing river washed debris down to the coast, turning seawater partially muddy. A 64-year-old man and a 9-year-old boy were found dead underneath a mudslide. Associated Press writer Yuri Kageyama contributed to this report.